The Gratitude Challenge is a fun way to help students remember that there is always something to be thankful for. 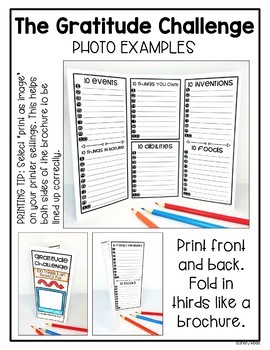 This NO PREP, meaningful project is in an easy-to-use trifold (brochure) format, and will get your students thinking about gratitude. 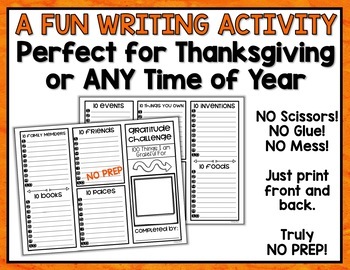 Perfect for Thanksgiving writing! Please see the PREVIEW above for an idea of everything included in this loaded resource! 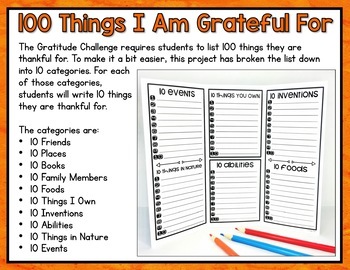 The Gratitude Challenge requires students to list 100 things for which they are thankful. To make it a bit easier, this project breaks the list down into 10 categories. For each of those categories, students will write 10 things they are thankful for. The project should be printed on one sheet of paper, front and back. It can then be folded into 3 sections, in brochure format. No scissors, glue, or staples needed! You will love the ease of this project. PRINTING TIP: Select “print as image” on your printer settings. This will keep everything centered and all lines should print.